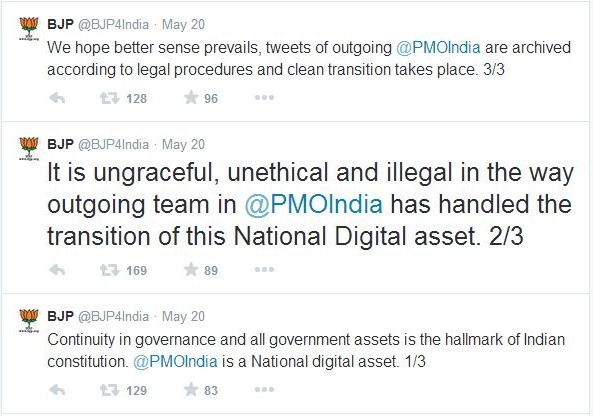 @PMOIndia Twitter Account Fiasco…Is It Finally Over? When the Indian constitution came into effect in 1950, no one even dreamt of the Internet. Who would have thought about social media properties and ‘digital assets’? But this new-age digital problem cropped in as soon as India chose its first ‘post-Twitter Era PM’ on May 16. Lot of debates have been happening on Internet as well as Television on various aspects like: Who will own the official Twitter account of the new Indian PM? What happens to the old account? What about the Twitter followers of the old PM? 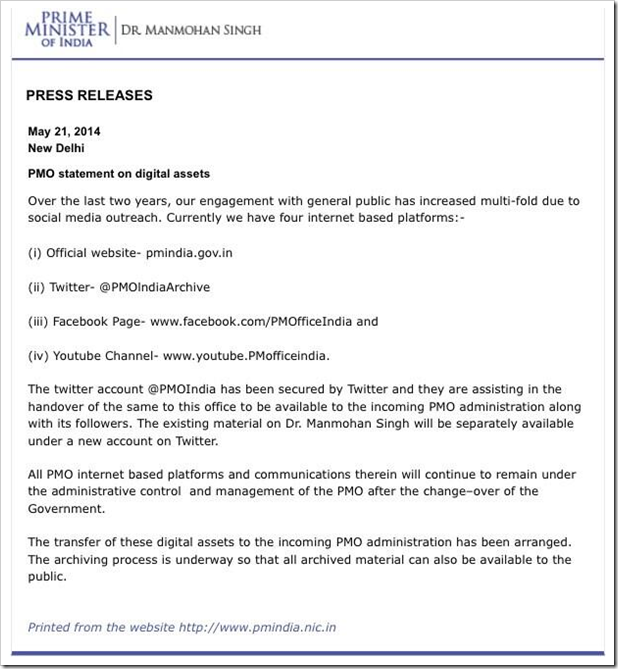 The PMO Twitter account issue snowballed on May 20, when the Prime Minister Office (PMO) silently took over 1.24 million Twitter followers of the official Twitter account of our ex-PM Manmohan Singh: @PMOIndia, and transferred (renamed) to a new Twitter account: @PMOInidaArchive. BJP’s pretty active digital cell took note of this development, and responded with severe criticism. Now, something really interesting happened in between this transition period. A 19 year old high school kid from Lucknow accidentally claimed the just released @PMOIndia handle, and became owner of that. BBC was quick to cover the news and it became a trending story within few hours. In a series of Tweets, he explained that PMO office holds complete control over the digital assets of the PM: Twitter account, Website, Facebook page and Youtube channel; and the transition is being carried out, officially. All the old Tweets and followers of our ex-PM has been transferred to a new archive account: @PMOIndiaArchive. Interestingly, the official Twitter account of Narendra Modi has 4.29 million followers, way more than the official account of the PM which had 1.24 million followers. Twitter has realized what serious blunder has happened and has retained access of the @PMOIndia account immediately. Once Modi completes the oath taking ceremony (scheduled on May 26th, 2014) and officially takes over the PM office at 7, Race Course Road in New Delhi, he will take over the account and his office can then officially start tweeting from that account. Some analysts are arguing whether he should continue using his personal Twitter account rather than using the official account, inherited from the ex-PM. As India has never experienced such an issue, the matter is open to discussion. Twiplomacy, which monitors official Twitter accounts of world leaders has tried to find a solution to this problem as they investigated what will actually happen to the official Twitter account of US President Obama, when he leaves office in 2016. Obama also maintains his own account, which is personally managed by him. At the same time they have a separate White House account as well. And both these accounts are two of the top 5 political accounts in the world! In another case, when David Cameron became UK Prime Minister in 2010, his office changed the name of Twitter account from @downingstreet to @number10gov, keeping in mind the branding efforts carried over by his government. Just for the information of our readers, Twitter does provide a service using which any user can download their entire history and create an archive file in the form of a HTML file, which can be easily viewed across everywhere. Being an issue which was entirely new to the Indian government, and politicians, there was a lot of confusion regarding the transfer of the accounts. Hopefully lessons have been learnt, and the future governments will find a way to smoothen out the transfer of power – both political and digital.